I've been publishing Linkedin statistics for Finland for years now, 1-2 per anno, but now it's time to go Nordic! The Finnish stats are deep and wide, but I'll start with a couple of general stats cross-Nordic, and let's take it from there, okay? Nordics are doing just fine, by the way, when comparing Linkedin usage between European countries (per capita), all in top 15 in Europe. 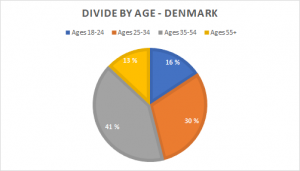 How different age groups use Linkedin in the Nordic countries? When comparing Linkedin usage between the Nordic countries at different age groups, the divide is not too big, but some surprises can be found. Sweden and Norway are in perfect harmony, even if the actual number of users is very different, and even if there are differences in Linkedin adoption compared to population. But when it comes down to how different age groups use Linkedin, they are exactly at same level. Equal amount of users in both countries are using Linkedin, down to a single percentage! Finland and Denmark get to be the far ends. The biggest difference being, that in Finland considerably younger people use Linkedin compared to other Nordic countries, and in Denmark the average user is much older... Go figure?! In Finland, 53% of all Linkedin users are under the age 35, whereas in Denmark the younger users represent only 46% of all users - Norway and Sweden both have 51% of the younger kind. As we all know, Finland is a hi-tech country, ICT in particular, and that shows clearly in the Linkedin statistics as well. 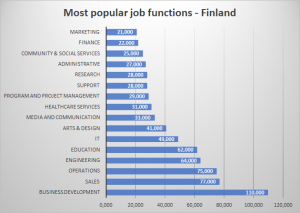 Among the most popular industries listed by Linkedin users, Information Technology, Computer Software, and Telecoms all rank in the top 7 in Finland. IT being no. 1 with 70.000+ Linkedin users, followed far behind by both Research and Government Administration with 33.000+ users. Higher Education and Hospital & Healthcare still fit in to the list before SW and Telecoms that come 6th and 7th. Norway is clearly an Oil country! Even if Government Administration is the most popular industry, Oil & Energy come good second, 120.000+ and 97.000+ users, respectively! Construction, IT, and Hospital & Healthcare all have well over 50.000+ users each, showing a great spread amongst industries. Sweden is well known for its IT, Retail and Automotive industries, and to no surprise, those rank well in Linkedin users' industry ranking as well. Government Administration is clearly the most popular industry with 250.000+ users, IT comes 2nd with 160.000+ users, and Hospital & Healthcare and Construction with 120.000+ and 110.000+ users, then come Retail and Automotive at places 5. and 6. Denmark having most users per capita among Nordic countries, has a great spread, with many industries having a fair amount of people using Linkedin. Denmark's top industry is - surprise, surprise - Government Administration. Funnily enough, this makes Finland the only one of these 4 Nordic countries that doesn't have Gov't Admin at the top spot among Linkedin users. In Denmark the 2nd most popular industry is IT with 79.000+ users, followed close by by Hospital & Healthcare with 75.000+ users. The top 3 is followed by a great number of industries at good level; Higher Education, Civic & Social Organizations, Construction, Education Management, Retail, and Research all have over 50.000+ Linkedin users. Job functions - what Linkedin users really DO for a living! A typical Finnish Linkedin user works in the ICT industries and has a job in Business Development. It's as simple as that. Linkedin changed the way it evaluates a users job function last summer, and the change significantly effected e.g. how Finnish users are ranked. "Sales" has for years been the most popular job function all the way until last summer, when suddenly Biz Dev jumped to a clear no. 1, all because of the algorithm change. But as the algorithm treats all Linkedin users equally, there's no complaining there when comparing countries. And even if Finland is considered engineer- and hi-tech -driven, Engineering only comes 4th and IT jobs 6th among the most popular job functions. Meaning that to work in the ICT sector in Finland does not mean you have to be a techie at all! In Norway Operations is the clear no. 1 in job functions, followed by the popular Sales and Business Development, and Engineering jobs coming far behind at no. 4. Operations and Business Development are clear top job functions among the Danish Linkedin users, Education is just as clear no. 3 and Sales no. 4. 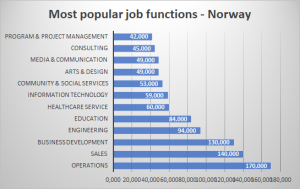 Not many surprises in Sweden either, as Business Development and Operations are the top job functions, Sales, Engineering, Education and IT following the lead. All'n all, the biggest surprises in job function rankings are not in top, but far behind it. And the anomaly here is once again Finland. I guess not being part of actual Scandinavia, not speaking a Scandi-language and not having it's own language version of Linkedin really have made Finns act differently! Outside of the top 10, Finland has some very different job functions listed compared to other countries in question. Research and Marketing are in Finland much more common job functions among Linkedin users than in any of the other countries, where Consulting is the function that ranks well in all others but Finland. Consulting is at places 10-12 in Denmark, Sweden and Norway, but don't even fit in to the top 16 in Finland, and Finland is the only country with Research and Marketing this close to the top. That's all, folks, stay tuned for next blog posts coming soon and more Linkedin stats again in 2019! If you want to stay tuned in, subscribe to the newsletter!